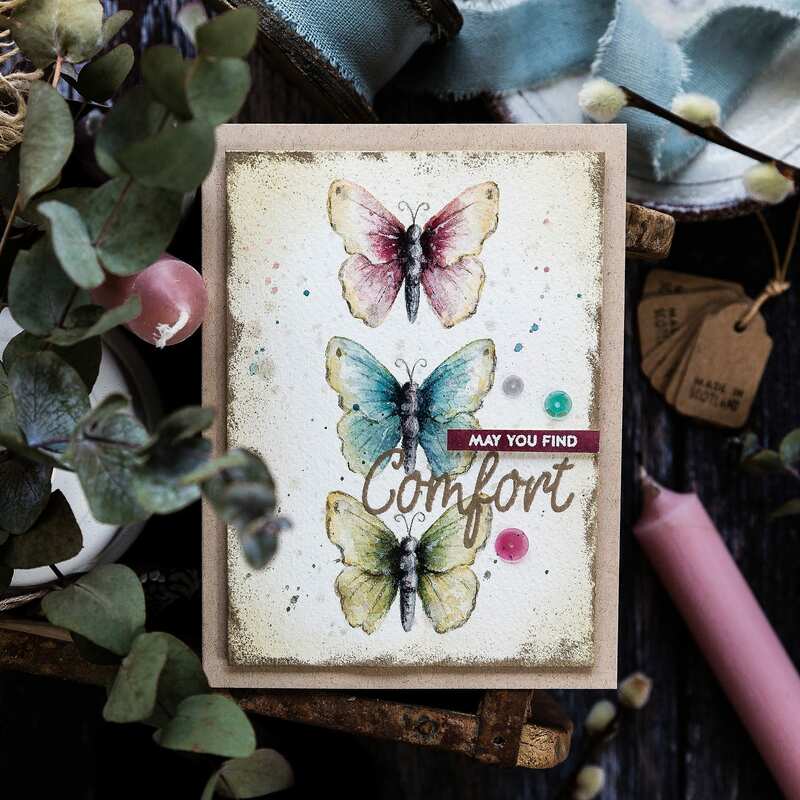 There’s a new release from Simon Says Stamp today, Blossoms & Butterflies and going with the title I picked out the Comfort & Prayers set to paint a trio of butterflies. I’ve linked all supplies at the end of this post. Compensated affiliate links used where possible at no cost to you. Before I crack on with the details of the card, let us take a closer look at what is included in the new release. So, back to the butterflies! 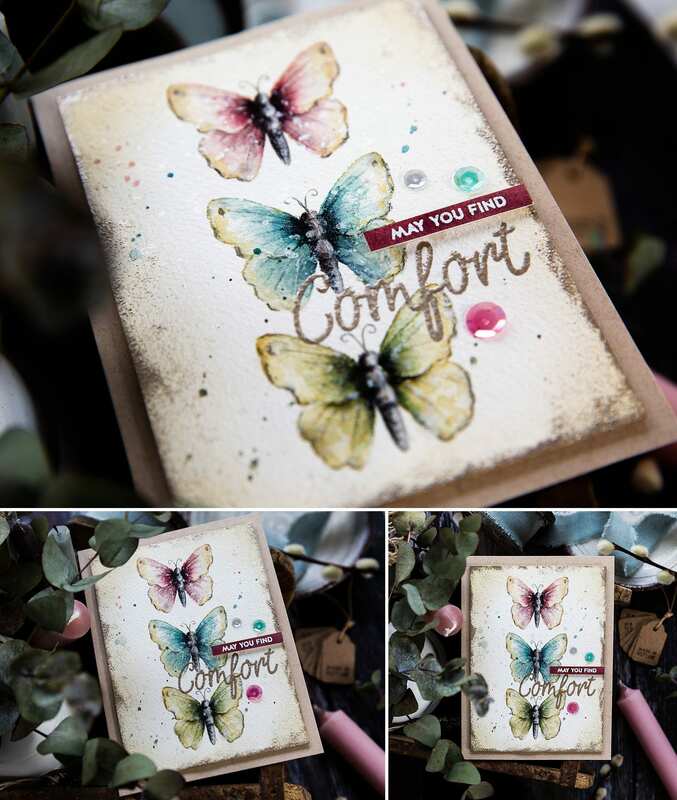 I took one of the butterfly images from the Comfort & Prayers set and stamped it three times in a row with Gina K Whisper ink on Arches Cold Pressed watercolour card. This is my first time using this ink, and I love it! It’s barely there and so blends in with the watercolouring, and yet you can see it enough to act as a guide to colour. I painted the three butterflies using Daniel Smith watercolours and referencing one of the videos by Dawn Woleslagle that really got me into watercolouring in the first place. I can’t thank Dawn enough for inspiring me and sharing her knowledge so freely. I finished off the colouring with a couple of pencils to deepen the shading. Having watercoloured the butterflies, I splattered with leftover paint and Perfect Pearls solution. I then trimmed the panel to be slightly smaller than an A2 card base. I blended Antique Linen Distress Ink gently around the edges of the panel for a more homely feel and then dragged a clear embossing pad around the edges too and sprinkled with Platinum embossing powder and heat set. I love the vintage look of the muted metallic edges. 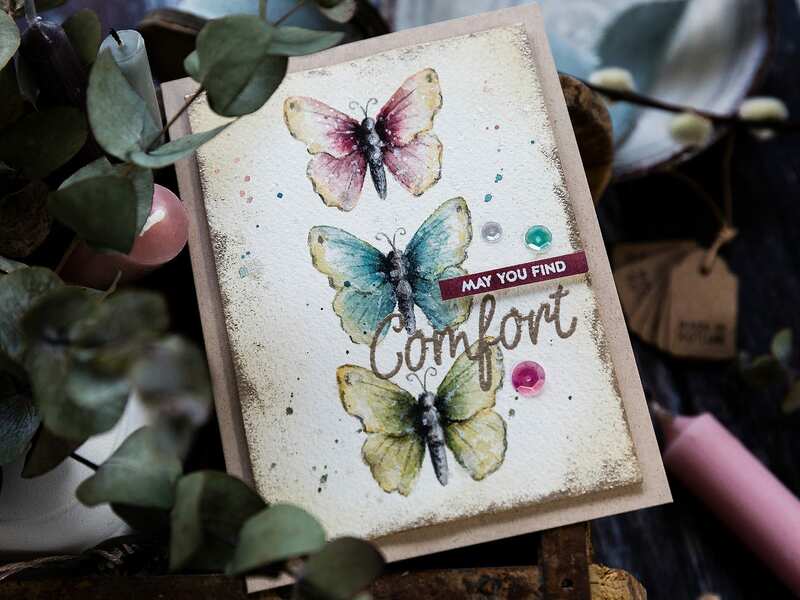 For the sentiment, I stamped the ‘comfort’ greeting from the Comfort & Prayers set in clear embossing ink and heat embossed with more of the Platinum embossing powder. 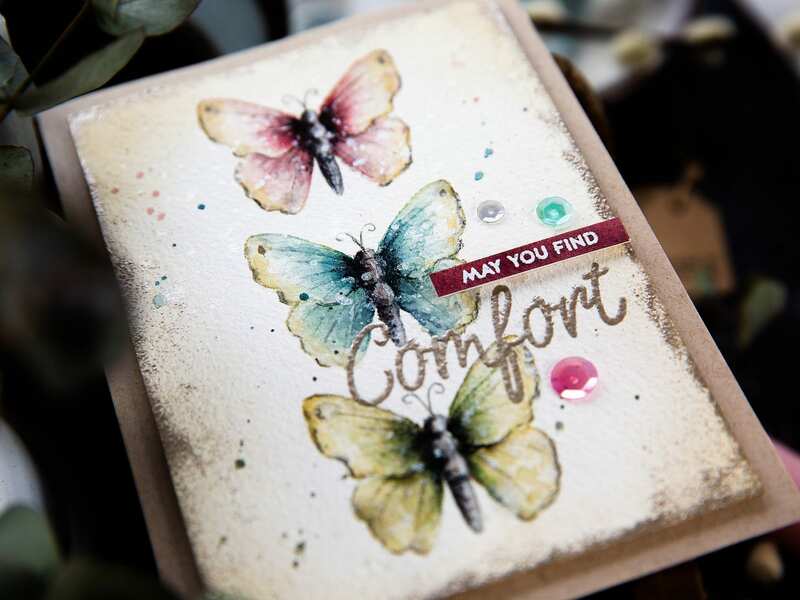 I paired this with a banner I stamped with a coordinating sentiment in clear embossing ink on a scrap of Hot Pressed watercolour card painted to match one of the butterflies. I then white heat embossed the sentiment, trimmed to a banner and added with foam adhesive. I added the finished panel to a Desert Storm card base and accented with a trio of toning sequins. Following today’s release, there are two blog hops coming tomorrow and Saturday. I’m joining in with Day 2 on Saturday with this pencil colouring on kraft card you can see a peek of above which uses the Floral Mix Background set among others. I hope you’ll join me again then. Your watercoloured butterflies are stunning. Thankyou for sharing this beautiful card. Hi. Initially I did not love the Comfort and Prayers stamp set. But, you have changed my mind w your lovely card. I would like to have a video of your creating this card, if you could tell me if you produced one and where to find it? Your card is breathtakingly gorgeous!! I absolutely love it!! Your cards are absolutely stunning. Great inspiration! WOW! I would never have thought to use my colored pencils on anything other than white paper. 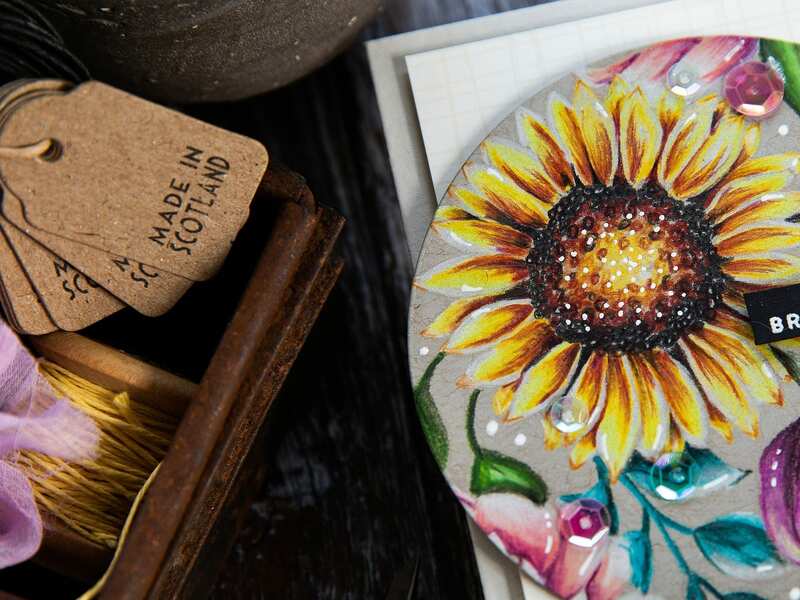 Coloring on craft or gray is so very lovely and reminds us to use something we already own. Thanks for sharing this gorgeous card! The butterflies are stunning and your colour palette just beautiful. Awesome SSS release! Gorgeous creations! 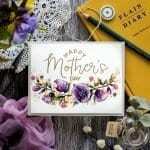 I especially love the gorgeous butterflies card! I absolutely LOVE this card. I too wish there was a video, but I will check out Dawns. Thank you so much for the inspiration you give. You have amazing talent. Thank you!!! !